"...A Town isn’t a Town Without a Bookstore"
There is always an end in a book. But there is no end in searching for good books. 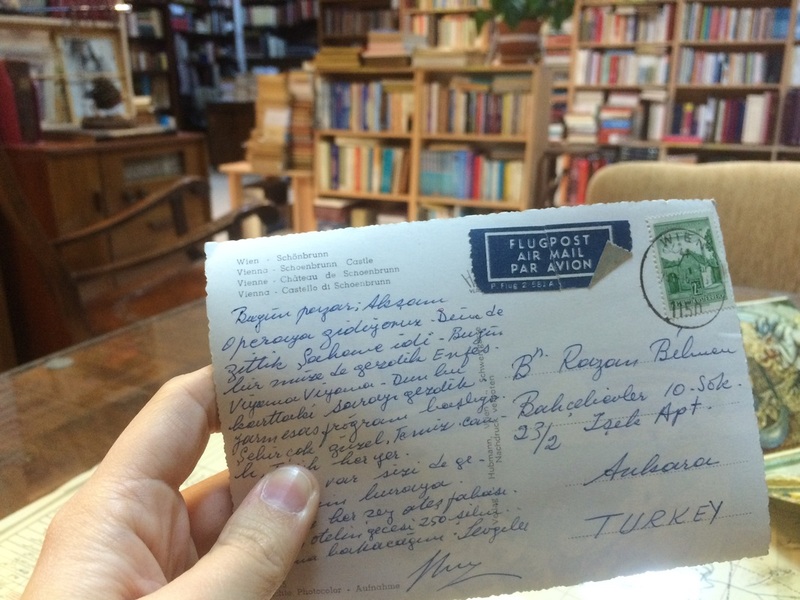 I've enjoyed and learned a lot in my second-hand bookstore haunting in Ankara. I've met with great book-lovers and listened to their stories. I came across many interesting books, magazines, ephemeras and many more. Hope I was successful in sharing my experiences. One thing that this blog will always remind me of is that without bookstores, particularly Sahaf, Ankara would be lacking in literature, culture, history and art. I appreciate that these second-hand bookstores I've visited keep providing their great services. Although, I'm finishing my blog here, I'll keep going to these stores and search for many more amazing books. I bet that collecting is, small or big, definitely a part of everyone's life. To remember, to revive, to feel and to understand, we collect things that belong to a specific point in time. Most of us do this unconsciously, but as we all know, some people call themselves collectors. It is in our nature that we can't break the bond with our past. 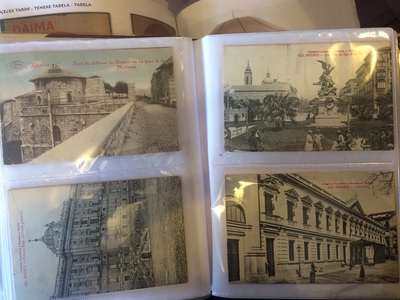 We need photographs, postcards, tickets, reports, posters and many other material that can document our experiences. So, what I'm really saying is we need ephemeras. Not because ephemera is a temporary paper item, but because ephemera means time itself. 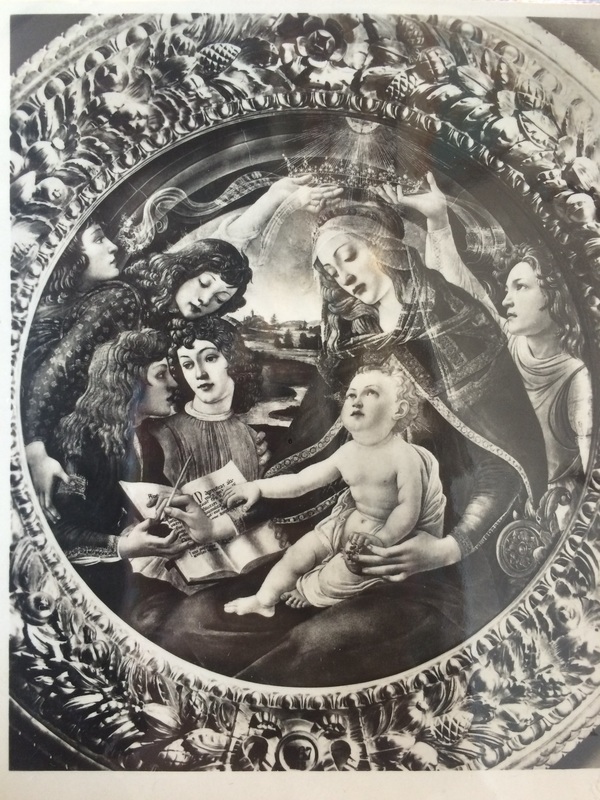 Maurice Rickards, who is one of the early ephemerists, redefined the concept and opened a new window to study and research on ephemera collection. His definition for ephemera which is "minor transition documents of everyday life" is now accepted by ephemerists around the world. So, thanks to him, the seeds of ephemera collection as a movement was sown. 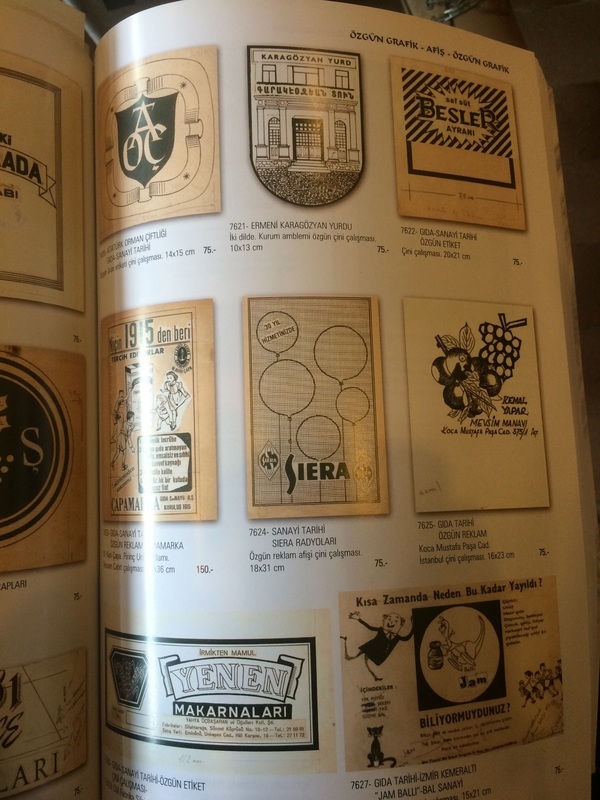 Ephemera collection is enormously common in Turkey as well. I found a great catalog which was published after an auction in 2011. It has almost anything that can come into your mind! And the sections are divided into interest areas like advertising, TV, cinema, war, education, politics and so on. But, why particularly ephemera matters? Yes, it is about history, about our very personal past, but in what way it is plausible to collect ephemeras? 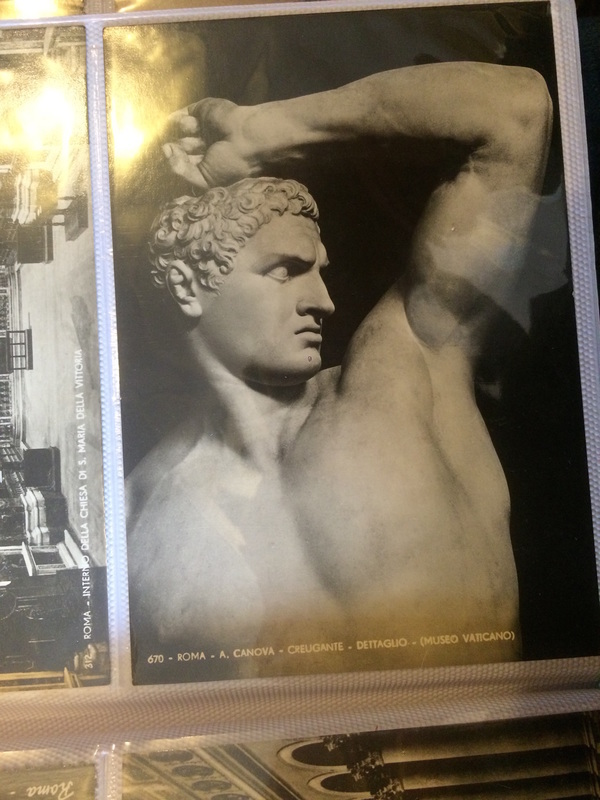 Well, to me, first thing that is appealing about ephemera is the appearance. 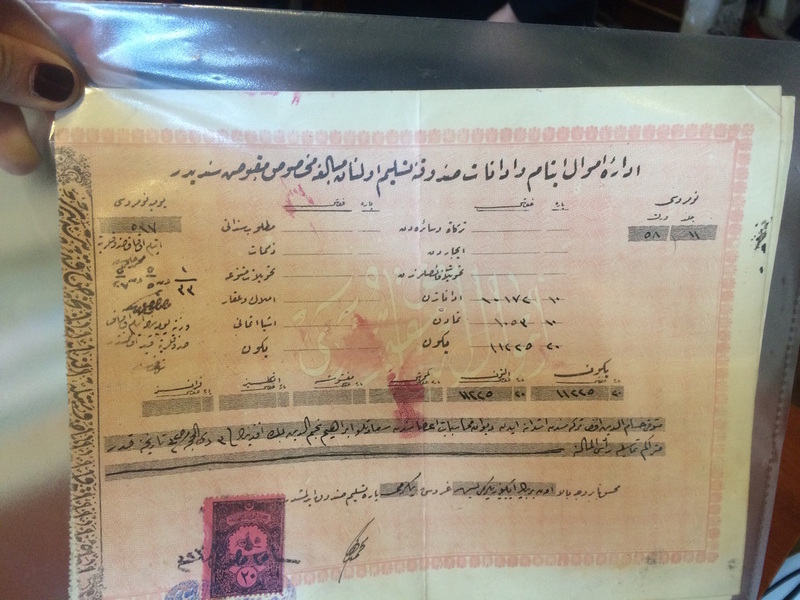 The nostalgic beauty and authenticity of a piece of paper. The design and typography which is very unique to its time-slice. Who doesn't get pleasure from a special presentation of time which is full of history and has interesting visuals? It is even more interesting if this piece of paper is somewhat related to your past. A package of chocolate you used to eat when you were a child, your first concert ticket, the first letter you ever got from someone special. This list can go forever, and I'm sure you agree with me as you read through this; just the appearance of ephemera items can be evocative. Besides their beautiful look, the content of these items are very much valuable as well. They glimpse into the social clues of a particular time and place. They can be used as a source for academic researches to find out how people communicate, what words and expressions they use, what kind of art is popular etc. 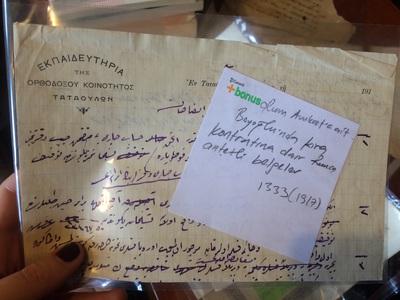 Ahmet Yüksel, Sanat Kitabevi's owner, says "Ephemera collection is a part of our job, postcards, letters, maps, stamps...And these are very important materials for researchers". The main reason is that these materials are direct sources from the past. They are vulnerable, but also carriers of the history since they actually existed in that part of time. 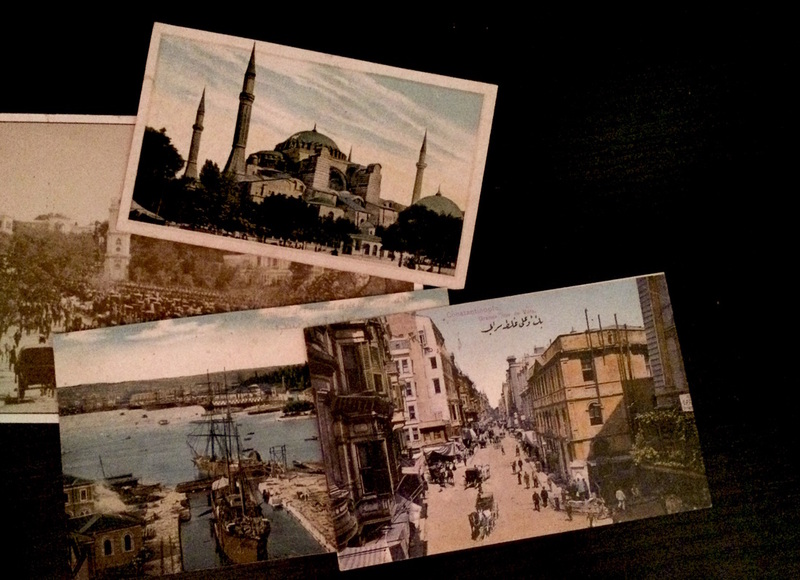 As I was rummaging through the ephemeras in Sanat Kitabevi, I found some postcards that were actually sent to someone in the past. Having access to these very personal documents made me feel like I was being witness to someone else's private life. Well, some of them were quite hard to read because of the hand-writing, but it's another beautiful part of ephemeras that you need to decode some vintage hand-writing. 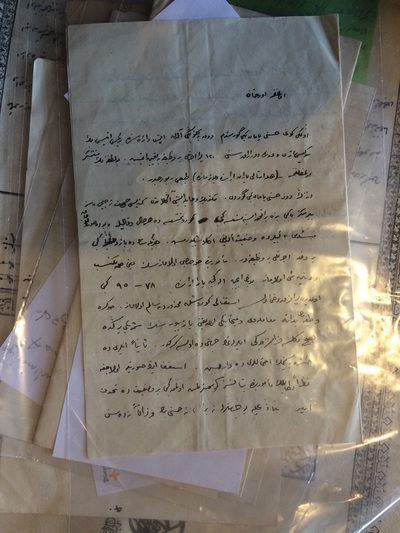 Anadolu Kitabevi has also a considerable amount of collection. The most interesting part of it was the ones written in Arabic and Romaic. I asked the Sahaf, Gökhan Tuğ, how they got these very old pieces. 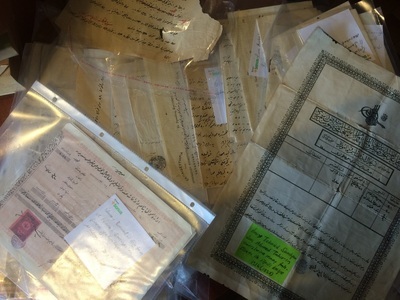 He says "Most of the time, people find these papers from their parent's stuff. And they don't understand what's written. Then, they bring them to us and we help them decode.". He also told me how hard it is to decode these items from different languages. Despite its difficulty, he says that it is really enjoyable to find out different stories and be able to transfer them. 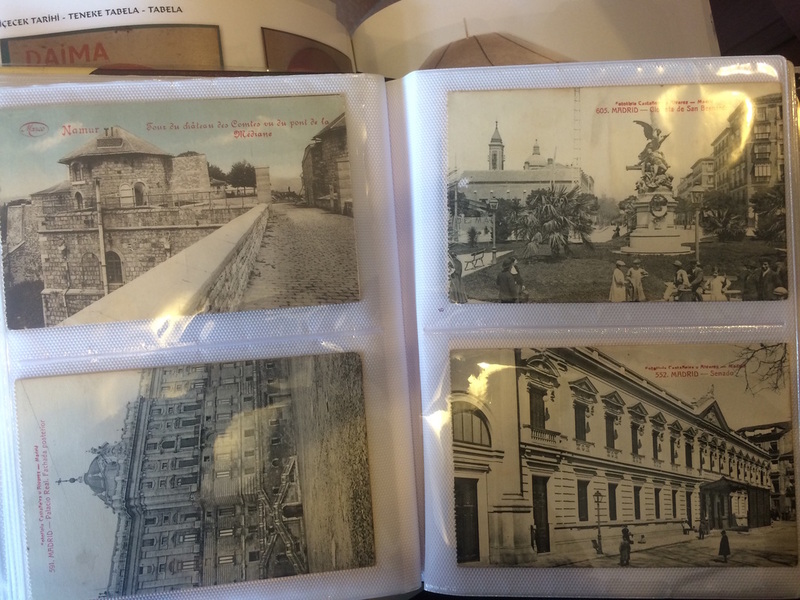 Another collection which is one of the most popular ones includes postcards from Europe. The pictures are so authentic and have very high historical value. 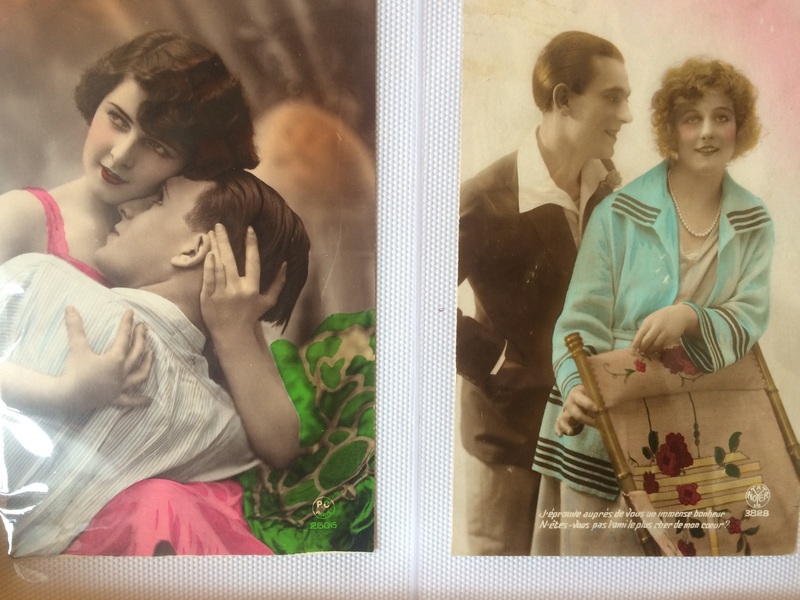 They keep these postcards in a photo album as they are more valuable comparing to others. Anadolu Kitabevi gets these postcards from the libraries they purchased. So, where can we find these special items? The first way is to go to a sahaf for sure. But you can also find them online! There were some auctions in the past, hopefully will be many more in the future, and you can also go to the museums to see ephemeras. There will also be a book fair between 8-12 January in Congresium. Don't forget to visit the sections for special ephemera collections that will be presented in there! Counting down to 2016, I wanted to review my blog with a couple of words! Have a look at what describes my blog best, and have a wonderful year filled with great books! Have you ever paid attention to inexplicable existence of cats in second-hand bookstores? Well, maybe it is explainable. Maybe there are some reasons that bring cats together with books. Or maybe I'm just talking about silly things. To me, library is the most calming furniture, of course when it's filled with books. You redecorate your room, move everything around, but when you find a good place for your library, you don't want to relocate it again. It enriches in time as you buy new books, or borrow from friends and don't know where to put them. Some people has very organized libraries, some has books outgrowing from the shelves. However it looks, library is stable, yet it carries plenty of ideas, dreams, stories and many more. That's why library creates a calm and cozy atmosphere. ​Library, full of books, requires you to be silent and respectful which is the ultimate desire of most cats. Bookstores are like heaven for them because they can sleep all day long in silence. Plus books can be a very comfortable bed for them sometimes. And for us, besides having good books, we can have adorable companies in a warm Sahaf in these cold days. Then I would say, life is good! Sanat Kitabevi's new adopted cat. She slept 2 hours nonstop when I was doing my interview. 02/12/2015. The word "first" itself always creates a superior meaning, doesn't it? Being first in something makes that thing special for us, while making the second one less important. When it comes to first edition books, it is the same for many collectors. Or, should I say obsessive collectors? First edition is literally means the first printed version of the book without major editorial works. For a regular reader, it might be hard to understand the importance of first edition. But, for collectors, first edition is the closest bond that they can build with their favorite authors. It is a way to actually posses the work. It is an obsession, but an honest one. However, does that really have to change the value of the book? Or, who decides a certain kind of book's first edition is so expensive, while another book's first edition doesn't cost very much. 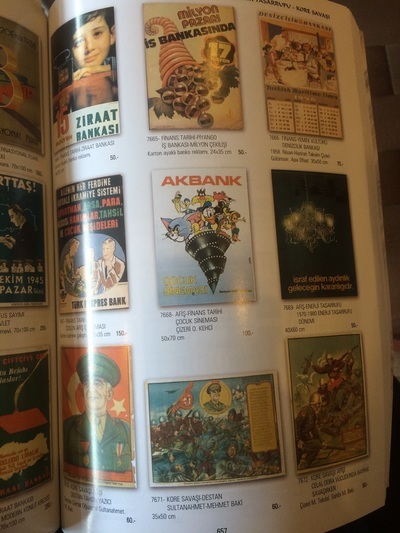 When I had my interview with Ahmet Yüksel- Sanat Kitabevi's owner- he said that he doesn't understand how people estimate a price for first editions. However, he sells them anyway. 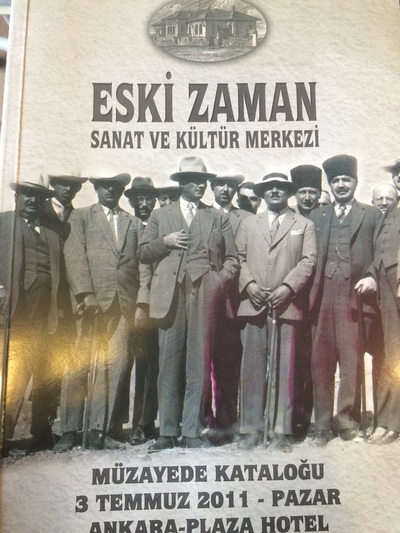 Sabahattin Ali says in his great book "İçimizdeki Şeytan" (The Devil Inside of Us), "Milyonlarca senelik dünyada en eski şey yirmi bin yaşında" (In this millions years old world, the oldest thing is twenty thousand years old). So, having something special is very important for collectors because it links them with the original, with the youngest version of the book they love. As a book-lover, I felt something evoking in me when I look at the first editions. Who knows, I might become a collector as well! 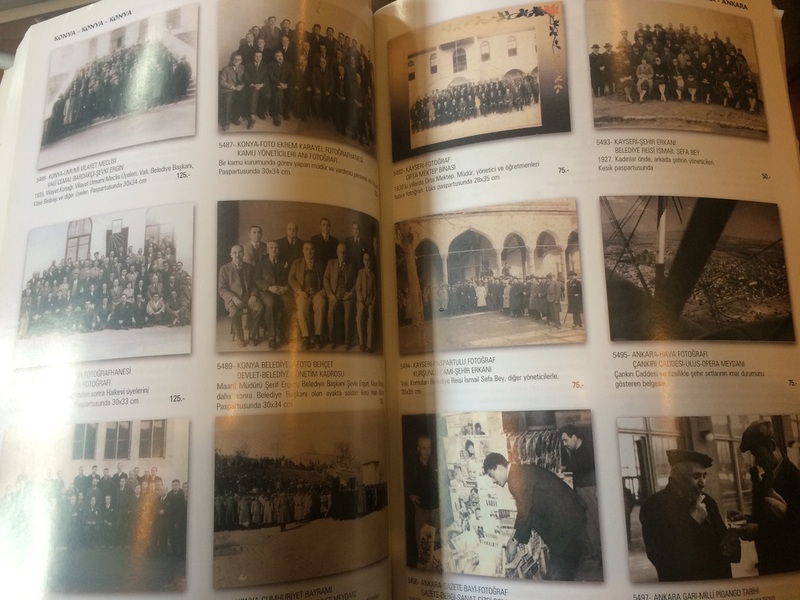 30 years ago, Ahmet Yüksel graduated from Ankara University with a Turcology bachelor. He immediately opened his little bookstore with his friend and started out his journey of being a very successful and one of a kind sahaf. Now, he owns Sanat Kitabevi which distributes books over countries, a research magazine called Kebikeç, publisher, and a little cute cat named "Esat Beyi" in his cozy bookstore. I got the chance to talk with him about his career, what kind of books he has and how he collects them, and also about his magazine. In our little chat, I've learned the ways to collect books, what "ephemera" means, and how his very special magazine, Kebikeç, became successful. Hope you'll enjoy the small story I compiled for you! What if I tell you that there are bookworms that can gnaw at your books. That there is also the king of the bookworms. How would you react? Probably laugh at me, right? Well, it may sound like I'm telling you a 5 years olds' nightmare, but people used to believe that the biggest bookworm actually existed in the past. And it is called "Kebikeç". There are many charms in Turkish traditions that we believe that they protect us from rubbers, sicknesses, fires and so on. So, why not protect our books as well? People used to put a special spell in the first page of their books to keep the little bookworms away. The spell simply means that "O worm, this book doesn't belong to you (it belongs to your king, Kebikeç), so stay away from it!". When the little bookworm sees that the book belongs to his superior-Kebikeç-, he gets scared and goes away. There is even a tale telling us that a man put the spell at the end of the book by mistake, and the bookworm started to eat it from the end. Then, the man was left with only the first page of his book. Why am I telling you about this weird superstition that existed hundreds of years ago in our culture? Certainly, not to scare you! But, I found out my favorite sahaf in Ankara, Sanat Kitabevi, publishes a magazine called Kebikeç. It is a very extensive magazine for researchers in social sciences. It is published every six months and around 600 pages long. When they decide on the topic for the upcoming magazine, they publish it on their website and inform their readers what they can expect. This is especially good for researchers who need specific sources. The writers of Kebikeç are from a variety of university including Bilkent, Hacettepe, and also universities in Germany like Ludwig Maximilian Munich University. For the ones who are interested in this very informative, intellectual magazine; their new issue is about photos, postcards and letters that are witnesses of our history. You can buy the magazine from Sanat Kitabevi or order it online. It is also possible to collaborate with the magazine and send them any beneficial information we have as readers. Only thing to keep in mind, pray for Kebikeç to protect your books tonight! Where is this Sahaf (second-hand bookstore)!? 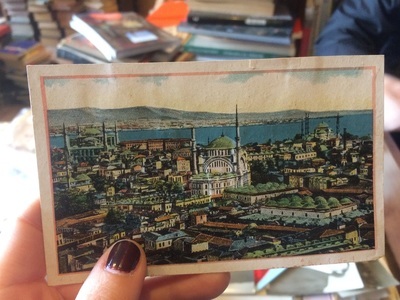 Even if you've been living in Ankara for a very long long time, it is perfectly reasonable that you may not know even a single second-hand bookstore in this city. It's not because there are a few of them, but it is because you don't really look around. To see a sahaf is nothing like finding the most popular bookstore in the city. But it is definitely not a difficult mission to accomplish. So, if you are like me, which means you have seriously no sense of direction whatsoever, try to plan your trip to sahaf. Forums like ekşi will provide you with some insight into this topic. You need to know what is out there before understanding where these bookstores are located. You should know that you need to walk into quiet, sometimes narrow, sometimes steep streets to see the sahaf you are looking for. The purpose of the sahaf is not attracting many people and offering them a shopping experience. Rather, sahaf is a place where you can quietly explore the history and culture, and spend as much time as you like. You want to get started with some directions, right? Here is the perfect map for finding second-hand bookstores in Ankara! Follow this on your phone, and you'll complete your trip without getting lost. However, getting lost shouldn't scare you. My experiences proved me that you can find really interesting stuff when you don't follow a certain path. Just last weekend, I didn't have any intention to go to a sahaf, but by mistake I walked into an unknown street in Tunus. 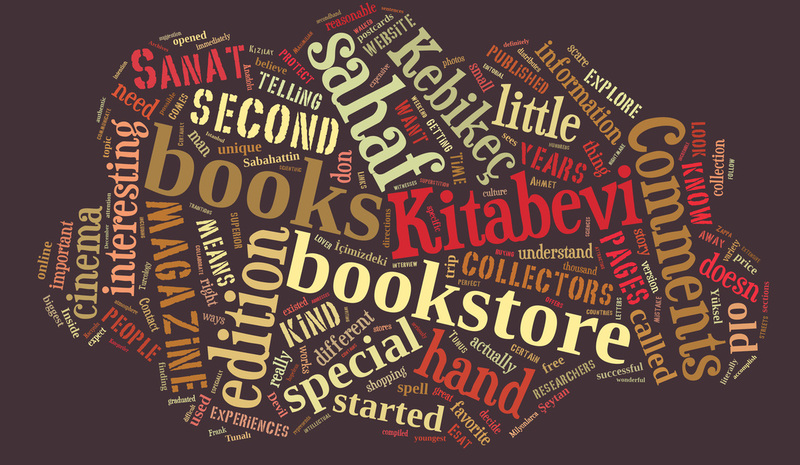 There I found a second-hand bookstore called Anadolu Kitabevi. It is a small sahaf that offers history, photography and arabic books. 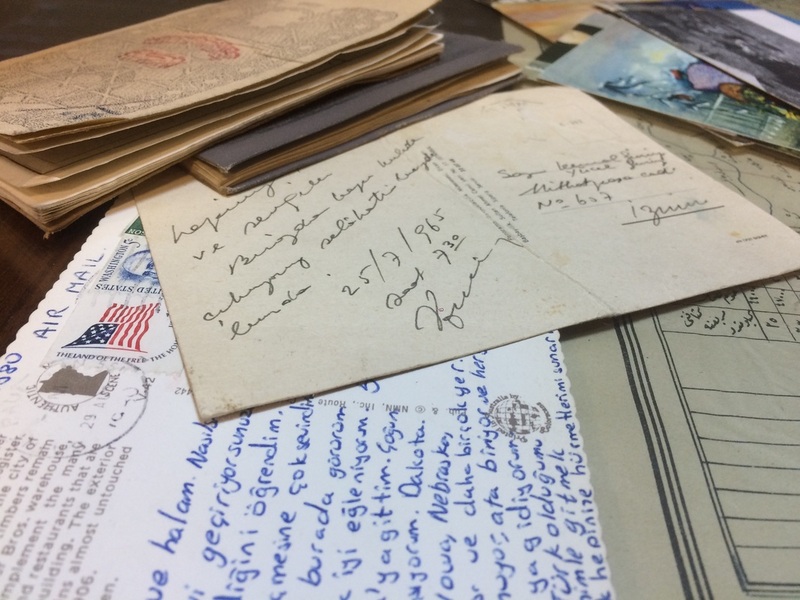 What actually strikes my attention was the small box in the middle of the store that contains many old pictures, postcards and letters. I got so excited because each item has an incredible history that makes you feel nostalgic. The fact that they are kept in a box randomly makes them look more authentic and inviting to explore. Still, if you are a kind of person who doesn't like to go out and explore, your case is not hopeless either. Here is the link for online shopping in one of my favorite second-hand bookstores. After all, we live in an information age. But, my suggestion for you to experience this unique atmosphere in a sahaf. You won't regret! I'm calling you, second-hand book lover in Ankara! I know that you don't always like going to Dost (the bookshop in Kızılay) and buying your books in a rush with a kind of shopping list in your hand. It's not always like you have a book in your mind, and you just need to go to the right section and pick it up. Sometimes, you just want to stand in front of a shelf and see a variety of different books that are not shiny, clean and have a price tag on them. Sometimes, the smell of dust and old pages together is what you all need to be willing to start a new book. Plus, everything used comes along with a different story which makes it very special. Seeing bookmarks on different pages, underlined sentences or side notes add even more characteristic to our special story-tellers. That's why, I want to share with you some of the unique second-hand book stores in Ankara, and tell you what kind of experiences you can expect from them. As Frank Zappa says, we don't have much time to read every great book, so let's start before it's too late!